The plant also has many names on the other half of the island. In Indonesian it is called pandan kelapa (lit. coconut pandan) and kelapa hutan (forest coconut),  but the latter can also refer to P. brosimos and P. iwen. The Dani people call it tuke. The Lani people call it woromo,  but this might be a separate species in the complex. It is possible a cultivar is listed more than once under different names, as Papua New Guinea has a very high linguistic diversity. Some subjective reports indicate that children are healthier after karuka season, but there may also be increased incidence of tropical ulcers and pig-bel (caused by Clostridium perfringens ). But the connections, if valid, are unclear. 1 2 3 4 5 6 7 8 9 10 11 12 Martelli, Ugolino (December 1907). Martelli, Ugolino, ed. "Pandanus Nuove Specie Descritte Manipolo II". Webbia, Raccolta di Scritti Botanici (in Italian). 2: 433. doi:10.1080/00837792.1907.10803460. hdl:2027/mdp.39015038487925. ISSN 2169-4060. OCLC 899525984. 1 2 3 4 5 6 7 8 9 10 11 12 13 14 15 Rose, C. J. (1982). Bourke, Richard Michael; Kesavan, V., eds. "Preliminary Observations on the Pandanus nut (Pandanus jiulianettii Martelli)". Proceedings of the Second Papua New Guinea Food Crops Conference. 1: 160–167. OCLC 17294235. 1 2 3 4 5 6 7 8 9 10 11 12 13 14 15 16 17 18 19 20 21 22 23 24 25 26 27 28 29 30 31 32 33 34 35 36 37 38 39 40 41 42 43 44 45 46 47 48 French, Bruce R. (1982). Growing food in the Southern Highlands Province of Papua New Guinea (PDF). AFTSEMU (Agricultural Field Trials, Surveys, Evaluation and Monitoring Unit) of the World Bank funded project in the Southern Highlands of Papua New Guinea. pp. 64–71. Retrieved 20 September 2018. 1 2 3 4 5 6 7 8 9 10 11 12 13 14 15 16 17 18 19 20 21 22 23 24 25 26 27 28 29 30 31 32 33 34 35 36 Lim, Tong Kwee (2012). "Pandanus julianettii". Edible Medicinal And Non-Medicinal Plants. 4. Springer. pp. 128–130. doi:10.1007/978-94-007-4053-2_17. ISBN 978-94-007-4053-2. OCLC 822591349. 1 2 3 4 5 6 7 8 9 10 11 12 13 14 15 16 Bourke, Richard Michael. 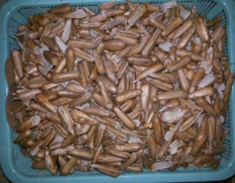 "Edible indigenous nuts in Papua New Guinea" (PDF). In Stevens, M.L. ; Bourke, Richard Michael; Evans, Barry R. South Pacific Indigenous Nuts. Proceedings of a workshop held from 31 October to 4 November 1994 at Le Lagon Resort, Port Vila, Vanuatu. Australian Centre for International Agricultural Research Proceedings. 69. Canberra: Australian Centre for International Agricultural Research. pp. 45–55. ISBN 1 86320 485 7. OCLC 38390455 . Retrieved 27 September 2018. 1 2 3 4 Bourke, Richard Michael (May 1988). Taim hangre: variation in subsistence food supply in the Papua New Guinea highlands (PDF). Australian National University. OCLC 224338489 . Retrieved 27 September 2018. 1 2 3 Stone, Benjamin C. (1982). "7 New Guinea Pandanaceae: first approach to ecology and biogeography". In Gressitt, J. L. Biogeography and Ecology of New Guinea. Monographiae Biologicae. 1. Dordrecht: Springer. pp. 401–436. doi:10.1007/978-94-009-8632-9_17. ISBN 978-94-009-8632-9. OCLC 5679030487. 1 2 Denham, Tim (July 2007). "Exploiting diversity: plant exploitation and occupation in the interior of New Guinea during the Pleistocene". Archaeology in Oceania. 42 (2): 41–48. doi:10.1002/j.1834-4453.2007.tb00015.x. ISSN 1834-4453. OCLC 696476493. 1 2 Tomlinson, D. L. (January 1988). 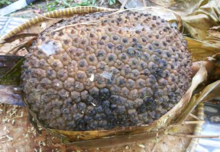 "A Leaf and Fruit Disease of Pandanus conoideus caused by Erwinia carotovora subsp. carotovora in Papua New Guinea". Journal of Phytopathology. 121 (1): 19–25. doi:10.1111/j.1439-0434.1988.tb00948.x. ISSN 0931-1785. OCLC 4660013776. 1 2 3 4 5 6 7 8 9 10 11 12 13 14 15 16 17 18 Stilltoe, Paul (1983). Roots of the Earth: Crops in the Highlands of Papua New Guinea. Manchester, UK: Manchester university Press. ISBN 978-0-7190-0874-0. LCCN 82-62247. OCLC 9556314. 1 2 3 4 5 6 7 8 9 10 11 Franklin, Karl J. (September 1972). "A Ritual Pandanus Language of New Guinea". Oceania. 43 (1): 66–76. doi:10.1002/j.1834-4461.1972.tb01197.x. OCLC 883021898. 1 2 3 4 5 6 Quartermain, Alan R.; Tomi, Barbara, eds. (2010). Fruits and Nuts: Research and Development Issues in Papua New Guinea Papers presented at the Fruits and Nuts Workshop held at the IATP Farmer Training Centre, University of Natural Resource and Environment (formerly University of Vudal) from 11–13 October 2005 (PDF). Workshop Proceedings. 9. Lae, Papua New Guinea: National Agricultural Research Institute. Retrieved 2 October 2018. 1 2 Stone, Benjamin Clemens (July 1984). "Pandanus from Ok Tedi region, Papua New Guinea, collected by Debra Donoghue". Economic Botany. 38 (3): 304–313. doi:10.1007/BF02859008. ISSN 1874-9364. OCLC 7025621147. 1 2 Goldman, Laurence (1983). "Talking about talk". Talk Never Dies: The Language of Huli Disputes. London and New York: Tavistock Publications. pp. 254–257. ISBN 978-0422782104. OCLC 993340993. 1 2 3 4 5 6 7 Franklin, Karl J.; Stefaniw, Roman (1992). "The 'Pandanus Languages' of the Southern Highlands Province, Papua New Guinea - a further report" (PDF). In Dutton, Tom. Culture change, language change - case studies from Melanesia. Pacific Linguistics. C-120. Canberra: Department of Linguistics Research School of Pacific Studies THE AUSTRALIAN NATIONAL UNIVERSITY. pp. 1–6. doi:10.15144/PL-C120.1. ISBN 978-0858834118. ISSN 0078-7558. OCLC 260177442 . Retrieved 25 October 2018. 1 2 3 Majnep, Ian Saem; Bulmer, Ralph (1977). Birds of my Kalam Country[Mn̄mon Yad Kalam Yakt]. illustrations by Christopher Healey. New Zealand: Aukland University Press. pp. 53, 150, 152. ISBN 9780196479538. OCLC 251862814. ↑ Pawley, Andrew (1992). "Kalam Pandanus Language: An Old New Guinea Experiment in Language Engineering". In Dutton, Tom E.; Ross, Malcolm; Tryon, Darrell. The Language Game: Papers in Memory of Donald C. Laycock. Pacific Linguistics Series C. 110. Memory of Donald C. Laycock. Canberra: Department of Linguistics, Research School of Pacific Studies, Australian National University. pp. 313–334. ISBN 0-85883-400-6. ISSN 0078-7558. OCLC 222981840. 1 2 3 4 5 6 7 8 Zebua, Lisye Iriana; Purnamasari, Vita (26 January 2018). "Oil of Pandan Kelapa Hutan (Pandanus jiulianettii Martelli): Physicochemical Properties, Total Phenols, Total Carotene, Vitamin E and Antioxidant Activity" (PDF). Jurnal Biologi Udayana. 21 (2): 71–77. doi:10.24843/JBIOUNUD.2017.vol21.i02.p05. ISSN 2599-2856. OCLC 7347063503 . Retrieved 20 October 2018. 1 2 3 4 Purwanto, Y.; Munawaroh, Esti (2010). "Etnobotani Jenis-Jenis Pandanaceae Sebagai Bahan Pangan di Indonesia" [Ethnobotany Types of Pandanaceae as Foodstuffs in Indonesia](PDF). Berkala Penelitian Hayati (in Indonesian). 5A: 97–108. doi:10.5072/FK2/Z6P0OQ. ISSN 2337-389X. OCLC 981032990 . Retrieved 25 October 2018. 1 2 3 4 5 Haberle, Simon G. (November 1995). "Identification of cultivated Pandanus and Colocasia in pollen records and the implications for the study of early agriculture in New Guinea". Vegetation History and Archaeobotany. 4 (4): 195–210. doi:10.1007/BF00235751. ISSN 1617-6278. OCLC 192800152. ↑ Halvaksz, Jamon (December 2010). "The Photographic Assemblage: Duration, History and Photography in Papua New Guinea" (PDF). History and Anthropology. 21 (4): 411–429. doi:10.1080/02757206.2010.521556. ISSN 0275-7206. OCLC 683378311 . Retrieved 12 October 2018. ↑ Pangkatana, John (September 21, 2018). "Karukas to be put to acid test in Central playoffs The Goilala Karukas are set to move into high gear" (HTML). Post Courier Online. Retrieved 4 October 2018.